I love this canopy of pink petals; I wish that it lasted longer than a few days, but I suppose the fact that it is so fleeting only makes it a greater beauty to behold. These photos are beautiful! 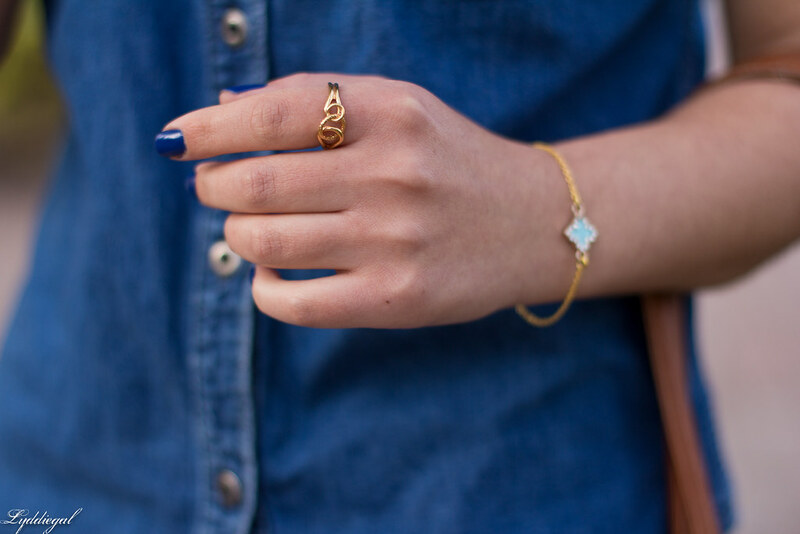 Loving that chambray. Love this look! 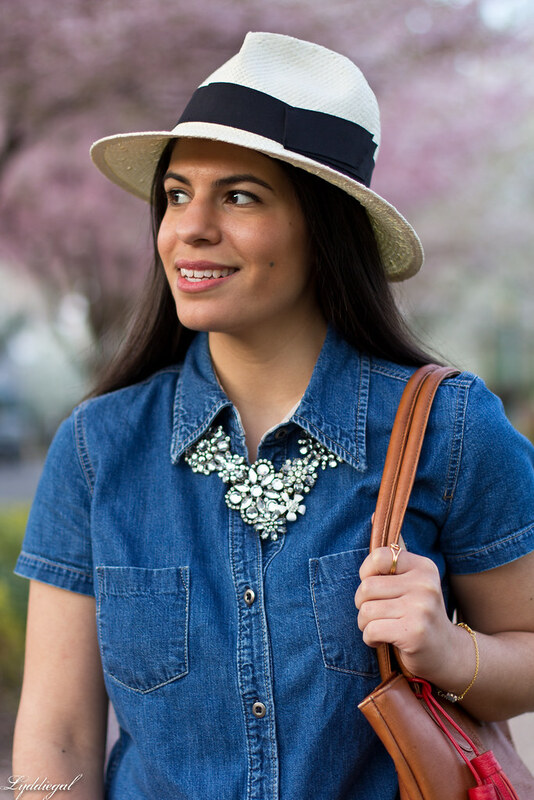 Chambray and white is so perfect together and I love that necklace! Fantastic look! Simple and totally chic! Love your bag! Love the sparkle that the necklace adds to this outfit! Indeed! But it sure is pretty while it lasts! Love your classic look under these pretty petals! I will never get tired of seeing outfit photos with cherry blossoms in the background. I sometimes think those little pink flowers can be one of our best spring accessories - although a good hat is also essential. I just love your straw fedora. I must have tried on ten of them over the weekend but none looked half as good on me as this one does on you! Gorgeous background! Super cute look and love that necklace. You have the best accessories as in necklaces, hats & handbags and you look Great under the pink clouds. really gorgeous backdrop lydia! 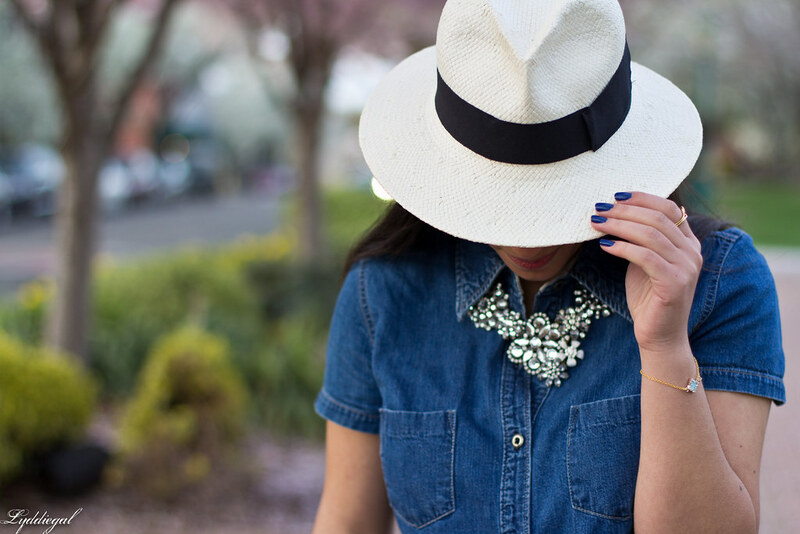 i love that mix of denim and sparkly statement necklace. So cute! I love your denim shirt! 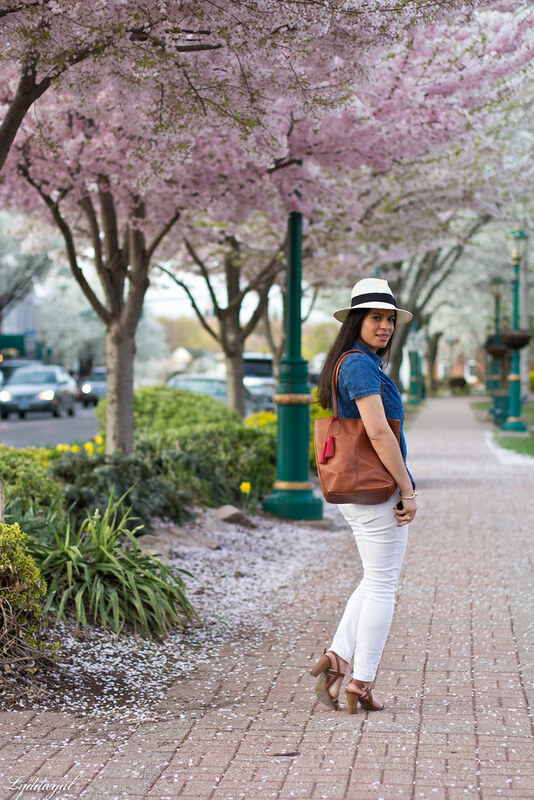 These photos could be in a magazine for spring fashion. Such a classic outfit and the background is gorgeous! What a great background! Love that hat on you! So pretty! The background is incredible for pictures. Love this outfit too. The jeans and hat are perfection. Oh, my what a beautiful backdrop. There are some things which never seem to get boring no matter how many times hew seen. Maybe that's the thing because they don't last for long and they are so beautiful. 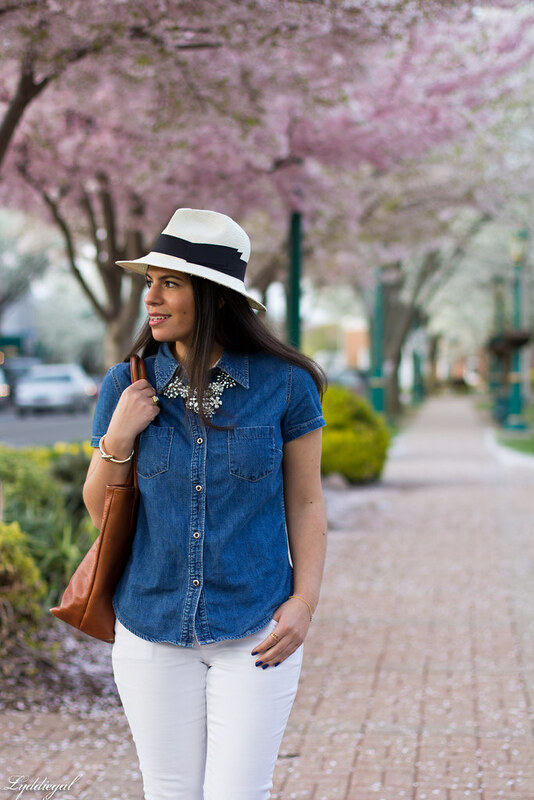 So elegant and timeless is your fedora and the look you have styled with it. 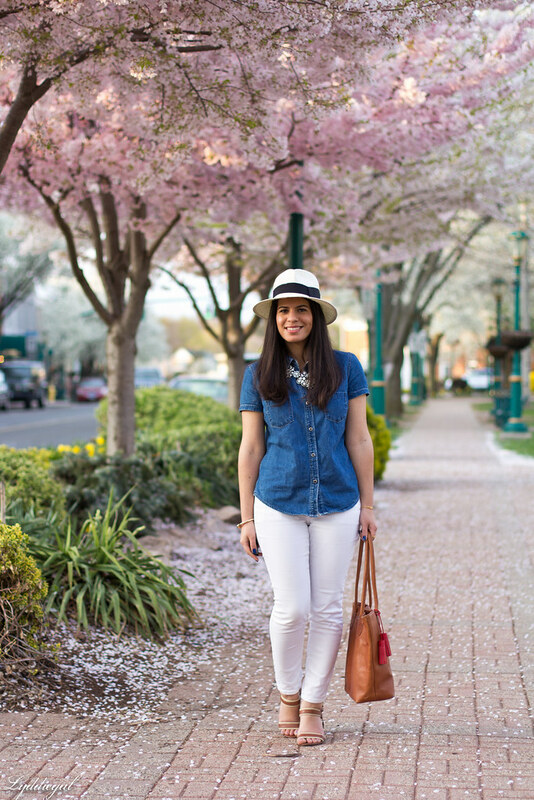 Love the short sleeve chambray with the white jeans! Under the pink petals is the perfect backdrop too! Gorgeous!! I am totally loving the background against your totally chic classic outfit :) Aren't those trees the best?! Fleeting, but beautiful! Love the chambray shirt!! So cute with that necklace. 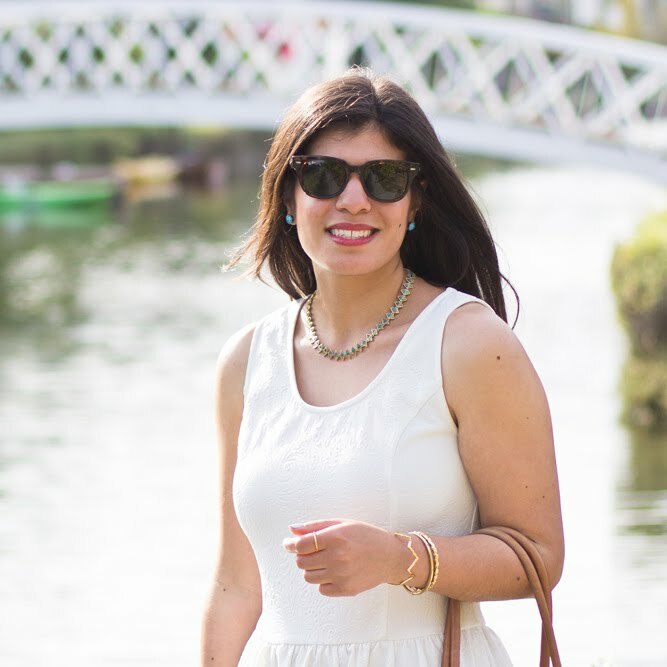 perfect classic look! u look gorgeous in that hat..and the background well that just speaks for itself..stunning! Absolutely stunning photos! Great outfit, love the chambray shirt! Wow this is so gorgeous! I love that backdrop, but you look even better! I love that hat and the casual denim shirt. Such a fun take on chambray - short sleeves. Looks great paired with white denim which I am seeing everywhere. So on trend! I want a short-sleeve chambray, darker wash like yours. It's refreshing and different for Summer. You always wear hats so well, too. I also get a little nautical vibe from this outfit. =) I knew you would like my turquoise hat.